FILE - U.S. Secretary of State John Kerry (L) and Russian Foreign Minister Sergei Lavrov (R) during a bilateral meeting focused on the Syrian crisis in Geneva, Switzerland, August 26, 2016. Intensive diplomatic efforts have resumed in what some observers see as a last-ditch effort to bring about a cease-fire in Syria. The 25-page plan HNC leaders presented on Wednesday proposes a six-month negotiating phase between the government of Syrian President Bashar al-Assad and the opposition. After that, there would be an 18-month period in which Syria would be governed by a transitional government made up of opposition representatives, members of the current government and civil society. That vision, however, is unlikely as long as the two main outside players in the conflict, Russia and the United States, refuse to compromise on their support for the two opposing sides. Moscow supports Assad and Washington adamantly wants him out of power. U.S. diplomats, speaking to VOA News, have expressed frustration with their Russian counterparts whom they have accused of reversing direction on some key points of agreement in recent days. U.S. Secretary of State John Kerry and Russia’s Foreign Minister Sergei Lavrov “plan to meet in the coming days to see if they can conclude an agreement, having now identified the remaining issues,” said Ben Rhodes, deputy national security advisor for strategic communications, traveling with President Barack Obama in Laos. Even if the American and Russian diplomats bridge those gaps it might not prove palatable to some of the elements fighting in Syria. "If what the Russians and the Americans agree upon is very much different from what the Syrians aspire to, then we shall not accept it," said Riyad Hijab, the top coordinator for the main Syrian opposition negotiating group at stalled U.N.-mediated talks in London. A key sticking point involves the fate of Syrian President Bashar al-Assad, whom the opposition groups insist must leave office at the end of six months of negotiations to establish a transitional administration. Britain’s top diplomat hoped to capitalize on what little common ground exists between the U.S. and Russian positions. “Even the Russians have accepted that there must be political transition,” Johnson said in a column of The Times newspaper Wednesday. “But then the Russians are also employing their military muscle to prevent him from losing and to keep him in power,” he wrote. 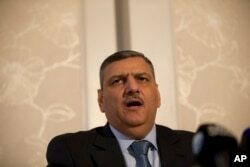 British officials portrayed the opposition’s plan as the first credible blueprint for a political transition in Syria. “The reality is that the Assad regime is pretty confident that it is not really under any military pressure, so why on Earth should it be interested in such a deal unless it was forced to by some sort of pressure from Russia and Iran,” said David Butter, a Middle East analyst at Chatham House. “But that does not seem to be a realistic prospect,” he told VOA. 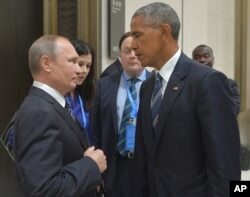 A proposed Syrian cease-fire was discussed on Monday during a 90-minute meeting between Obama and Russian President Vladimir Putin on the sidelines of the G-20 Summit in Hangzhou, China. Russian President Vladimir Putin, left, speaks with U.S. President Barack Obama in Hangzhou in eastern China's Zhejiang province, China, Sept. 5, 2016. Russia, along with Iran, supports Assad. Adel al-Jubeir, the foreign minister of Saudi Arabia, the primary rival of Iran, said Tuesday in London a cease-fire accord was possible within 24 hours, but cautioned that Assad is unlikely to abide by any agreement. A complex war has been raging in Syria for five years, fracturing the country, killing hundreds of thousands of people and displacing 12 million, more than half of the country’s pre-war population. Luis Ramirez contributed to this report from London.